Linear Tape-Open technology was developed by three leaders in the storage industry - HP, IBM, and Quantum - who brought together their combined expertise in tape technology to develop an entirely new format based on the best of existing technologies. The decision about which tape technology you should buy next should be based on your future, not your past, investment. The test program for HP Ultrium media is the most thorough and comprehensive in the industry. 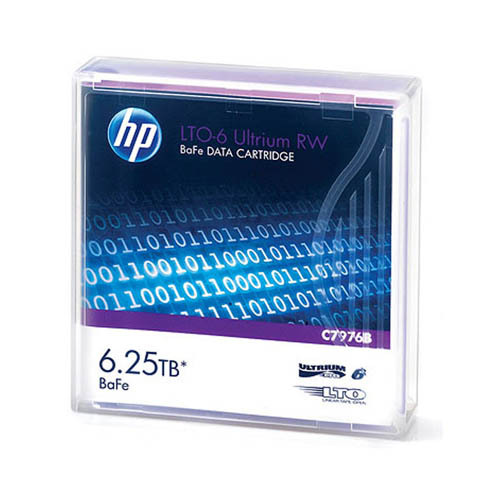 All HP cartridges must satisfy an exhaustive battery of additional tests that relate directly to real life situations, where real data and real businesses are at stake. The benefit of the HP brand specification for media is consistent quality. Through the testing of thousands of HP drives and HP cartridges, the ideal formulation for backup performance is defined and then continuously monitored. This hugely resource intensive process is unique to HP and affords deep insight into the HP+HP backup solution for a wide range of environments and duty cycles.